With dependable solid state electronics, HALOGUARD ® II is a cost effective, reliable way to detect the presence of halo- carbons, ammonia, and oxygen depletion. 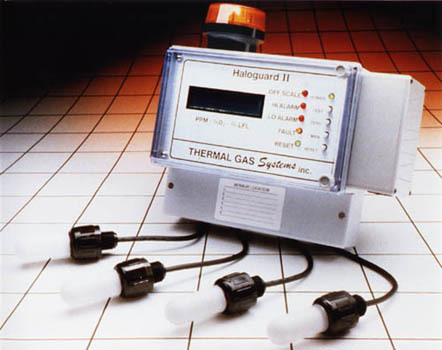 The multi-channel, multi-gas HALOGUARD ® II controller monitors sensors in up to six separate locations and provides both local and remote notification when gas concentration reaches an alarm level. We ’ve built in alarm relays and analog outputs to activate remote devices or to interface with a computer controlled energy management or building automation system. Haloguard II is unconditionally guaranteed for one year from the date of shipment. Any device found defective in that period will be replaced free of charge.